NEW. CONSTRUCTED OF DURABLE STAINLESS STEEL CUP WITH VENTED LID, IT'LL STAND UP TO WHATEVER YOU CAN DISH OUT. THE VENTED LID WITH A CONVENIENT HANDLE MAKES FOR EASIER DRINKING ON BUMPY ROADS OR ROUGH WATER. THE FLAT BOTTOM GIVES YOU MAXIMUM STABILITY WITH A GENEROUS 25 OZ. CAPACITIES FOR LONG OPS WHILE HUNTING, FISHING OR CAMPING. CAPACITY COMPACT 4"DIA. 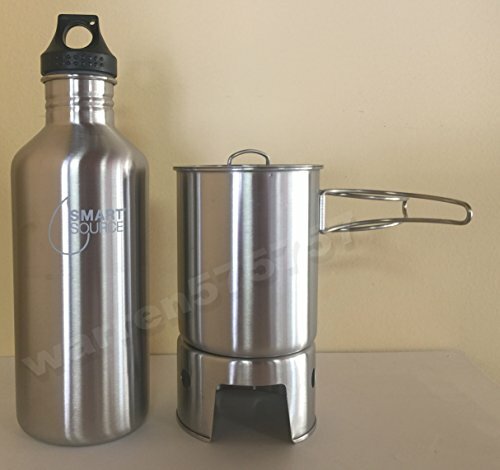 X 4 5/8"H. WITH NEW Stainless Steel Construction Bottle Backpacking Stove, AND NEW SMART SOURCE WATER BOTTLE 40oz/1182ml SINGLE-WALL MADE FROM DURABLE, LIGHTWEIGHT STAINLESS STEEL NON-LEACHING AND WILL NOT RETAIN TASTE OR ODOR SCREW-CAP MADE OF POLYPROPYLENE HOLDS : 40oz/1182ml * 18/8 STAINLESS * Measures approx. : 11 inches tall.